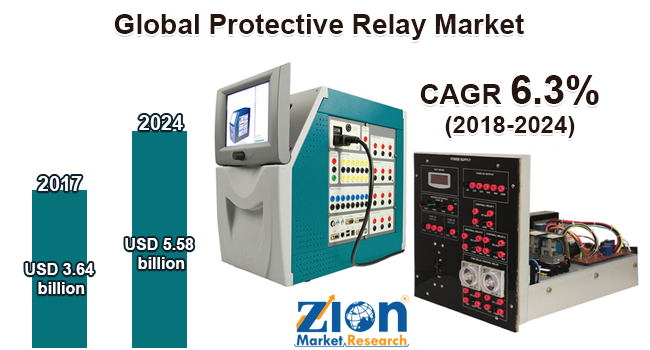 Zion Market Research has published a new report titled “Protective Relay Market by Voltage Range (High, Medium and Low), by Application (Feeder Protection, Transformer Protection, Generator Protection, Transmission Line Protection and Motor Protection), by End-user (Utilities, Industries, Marine and Renewable End Users): Global Industry Perspective, Comprehensive Analysis and Forecast, 2017 - 2024”. According to the report, the global protective relay market accounted for USD 3.64 billion in 2017 and is expected to reach USD 5.58 billion by 2024, growing at a CAGR of around 6.3% between 2018 and 2024. A protective relay is an integral part of the circuit protection system and it enables safe operation in an electrical circuit. The primary function of protective relays is to trip a circuit breaker when a fault is detected. A protective relay may respond to the magnitude of a quantity such as current or voltage. Protection relays use shaded-pole, magnets, operating and restraint coils, arrays of induction disks, telephone-relay contacts, phase-shifting networks, and solenoid-type operators. Ongoing huge investments in electricity transmission & distribution in order to reduce power losses in various developing markets of Asia, Latin America, and Africa are expected to increase the growth of protective relay market in the coming years. Furthermore, urbanization & industrialization tends to increase the power need & simultaneously helps to further fuel the demand for protective relays. Moreover, the rising demand of protective relay from manufacturing industries and processing industries for protecting expensive industrial machinery from damages in case of electrical short circuits or other circumstances will further flourish the market. On a contrary, a high cost of installation and maintenance is expected to restrict the growth of the market in the years to come. Nonetheless, the promising market for the intelligent controller is predicted to open up significant opportunities in the near future. High voltage protective relays dominated the voltage range segment of the protective relay market in 2017, owing to the rising preference from utility and large industrial consumers. The medium voltage protective relay is expected to become the most attractive segment in the forecast period. Feeder protection application segment held the largest market share in 2017, the growth of this segment is mainly attributed to increased use in switchyards by transmission & distribution companies. Transformer protection segment is expected to experience significant growth owing to demand gas monitoring & temperature monitoring. Utilities end-user segment acquired the largest market share for protective relay market in 2017. The growth of the utility segment is primarily driven by growing transmission & distribution network across the globe. However, increasing industrialization is expected to contribute to the growth of industry segment in coming years. With the largest market share, Asia Pacific was a dominating regional market for the protective relay in 2017 followed by North America. Rising urbanization coupled with ongoing electricity transmission & distribution projects are expected to fuel the growth of the protective relay market in the coming years. Latin America and Africa are expected to be the most opportunist region during the forecast period. Substitutes for conventional systems will be the key factor to boost the demand for the protective relay in the future. Some of the key players in the protective relay market are Schweitzer Engineering Laboratories, Inc., Basler Electric, Siemens AG, NR Electric Co. Ltd., Eaton Corporation, ABB Ltd., General Electric, Mitsubishi Electric Corporation, Schneider Electric SA, Toshiba Corporation, Fanox Electronics, and Littelfuse Inc., amongst others.